Two women have now publicly accused President Trump’s Supreme Court nominee Brett Kavanaugh of sexual assault, and at least 128 people were arrested on Capitol Hill Monday protesting his confirmation. Two women have now publicly accused President Trump’s Supreme Court nominee Brett Kavanaugh of sexual assault, and at least 128 people were arrested on Capitol Hill Monday protesting his confirmation. 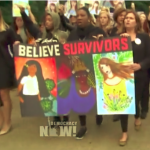 “This is a time for us to not just show up via a viral hashtag, but in person with our feet to the street to say that we won’t be treated this way and we won’t stand for another survivor to be treated this way,” says Tarana Burke, founder of the “Me Too” movement, who called for the national walkout Monday in solidarity with survivors of sexual violence. Marcy Wheeler is an independent journalist who covers national security and civil liberties. One year since Hurricanes Maria and Irma killed thousands in Puerto Rico and caused the longest blackout in U.S. history, we are joined by Naomi Klein, author of “The Battle for Paradise: Puerto Rico Takes on the Disaster Capitalists,” whose recent report for The Intercept is titled “There’s Nothing Natural About Puerto Rico’s Disaster.” Last week, President Trump generated widespread criticism when he falsely claimed on Twitter that thousands of people did not die in the two storms, even as a Harvard study estimated the death toll may top 4,600. Meanwhile, on Monday, President Trump declared himself an “absolute no” on statehood for Puerto Rico as long as San Juan Mayor Carmen Yulín Cruz, a major critic of his administration’s response to Maria, is in office. Following is a discussion of the role of the unelected PROMESA fiscal control board in the island’s unfolding economic crisis, with co-host and reporter Juan González.